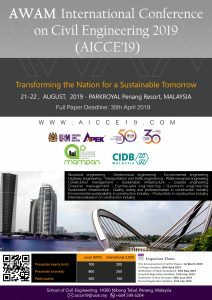 School of Civil Engineering (PPKA), Universiti Sains Malaysia in collaboration with CIDB Malaysia will be hosting AWAM International Conference in Civil Engineering 2019 (AICCE’19) in Penang, Malaysia on the 21st and 22nd August 2019. To date PPKA has successfully organized several international conferences, where the last one, in collaboration with Toyohashi University of Technology (TUT), IGNITE- AICCE’17 was held. Following the success of our past conferences, this AICCE’19 will continue our objectives in providing a platform for sharing of knowledge, experiences, initiatives, and best practices in addressing sustainability challenges among researchers worldwide. What’s more, with CIDB’s presence, AICCE’19 will empower new partnership and collaborations between researchers and civil engineering industries. Selected papers from the conference will be published by the selected publisher as a proceedings book volume indexed by SCOPUS.